As an investor you are continuously looking for opportunities to invest in new high-potential technologies and new markets. By investing in pyrolysis technology with us you will be among the first-movers in the market for green energy, biofuels and biobased chemicals. The market for sustainable, non-food energy and materials will experience huge growth in the decades to come. Explore our website to discover what a sustainable investment in a new pyrolysis plant may offer you, or contact us for more information. 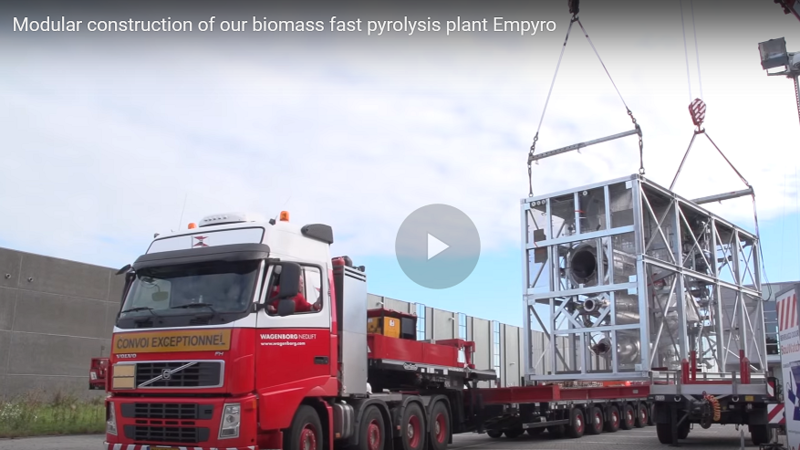 This 4 minute video is about how we built our biomass fast pyrolysis plant Empyro in just 8 days by using the modular building approach. Pages that may be of specific interest to you. We do not produce pyrolysis oil but instead focus on delivering to our clients the core components of a pyrolysis installation. Our projects have included pyrolysis oil production plants, basis of design studies, consulting on pyrolysis oil applications, client feedstock testing and oil sample deliveries. Latest news and tweets about BTG Bioliquids, FAQ, Downloads and Videos. BTL has a policy of actively seeking cooperation with other companies to gather and create additional expertise.